STRUCTURED CABLING: CONNECTION SYSTEM FOR DATA. Telecommunications infrastructure based on a system of cabling, connectors and devices that allow flexible installation and configuration, from a few work stations to large corporate buildings, offering comprehensive energy solutions. The structured cabling products are manufactured according to national and international standards to ensure the security of people, the equipment used and the information transmitted. 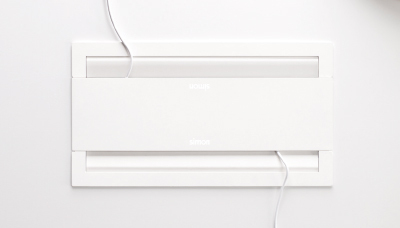 Every product in the Simon structured cabling range complies with the European RoHS manufacturing directive by using thermoplastic, metallic, self-extinguishing and halogen-free materials. 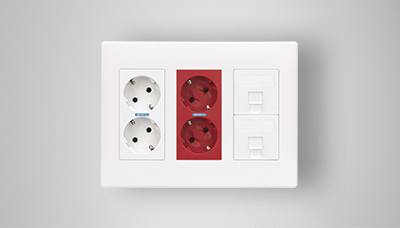 Our products are compatible with the wide range of voice and data connectors available on the market. 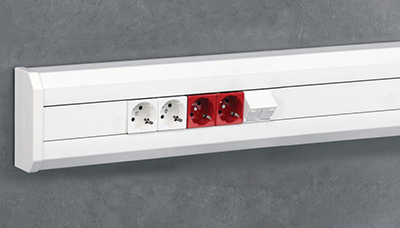 Fixed compartmentalisation to ensure that electrical and telecommunications cables are kept separate, thus avoiding electromagnetic interference, data transmission errors, and to optimise cable layout. ELECTROBLOCK: CONNECTION SYSTEMS FOR VOICE AND DATA NETWORKS. Electroblock energy solutions for 19” racks. RJ45 CONNECTIONS: CONNECTION SYSTEMS FOR VOICE AND DATA NETWORKS. RJ45 CONNECTORS: CONNECTION SYSTEMS FOR VOICE AND DATA NETWORKS. RJ45 connectors: high-speed voice and data. VOICE AND DATA CABLING: CONNECTION SYSTEMS FOR VOICE AND DATA NETWORKS. Voice and data cabling: information highways. VOICE AND DATA PATCH CORDS: CONNECTION SYSTEMS FOR VOICE AND DATA NETWORKS. Voice and data patch cords: the best connection link. TOOLS FOR CONNECTION SYSTEMS FOR VOICE AND DATA NETWORKS.